When I was a kid, after my parents split up, my dad used to jokingly say things like, "I wish me and your mom had made you a little brother or sister. Then we'd have another Little AshleyRose." I know a lot of kids out there want brothers and sisters but the very idea of another person just like me put an almost indescribable fury inside me. It made me angry. Really angry. Later, my parents went on to create my half-siblings who I love to no end and would do pretty much anything for. But the question of "another me" comes up just as often now that I'm a grown woman who doesn't want children. "Don't you want another little you running around?" people will ask. "Not even a little bit?" Here's the thing, if I found out another me existed (by way of cloning etc.) we would inevitably end up in a ridiculous knife fight. Two AshleyRoses enter. One AshleyRose leaves. I don't know why I'm like this. I just am. I find the idea of another me offensive and I would straight up murder my clone. 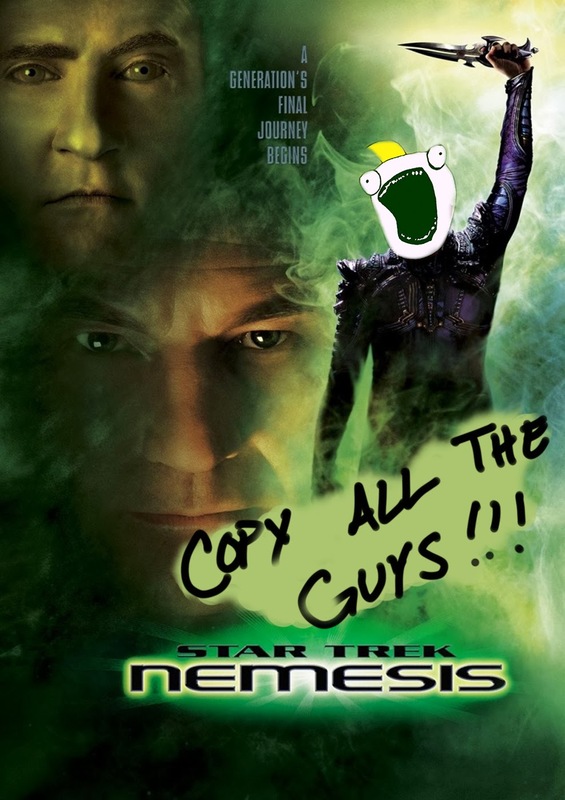 I was thinking about this as I watched the last TNG movie, Nemesis. This thing is just full of duplicate guys. The Enterprise is wandering around and happens upon (not actually a coincidence) an extra Data. 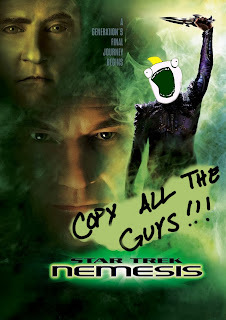 Then, they get to Romulus and its significantly crappier brother-planet, Remus, and find a Picard clone. I'm not especially keen on this movie. Especially Deanna's treatment as a victim, even though they kind of give her a bit of a comeback scene, I just really dislike the "Troi gets dream raped" plot line. Neither Worf nor Beverly get much to do here and Riker mostly just gets to fist fight Ron Perlman for a while. Geordi gets a nice emotional arc with Data's loss but, in all, I much prefer to think of Insurrection as this cast's goodbye. It's simple, sweet, and all about a bunch of besties going on an adventure together. No knife fights with one's clone. I really didn't like this one at all. In fact, I'm not sure if I even finished watching it.